Personalised - Rugby Sports Nose Eye Glass Holder. Be the first in your family to show off this Rugby Sports Nose Award Winning Eyeglass Holder. A Fantastic Gift for any Rugby Fan supporting the England Team. This Eyeglass Holder can be Personalised with Your Surname on the Front of the Base and your Favourite England Player Number on the back. Please allow 3 extra days for Personalisation. 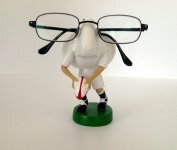 Have your spectacles at hand on this novelty Rugby Sports Nose. These novelty Nose Eye Glass holders hold your eyeglasses safely and securely in the one location when not being worn. Price includes Personalisation and postage in Ireland & UK.